Is the U.K. Ready for the Chancellor’s Holler? Because all eyes were focused on Japan and Libya during the past week, the downward revision to the U.K.‘s growth forecast from the Organization for Economic Co-operation and Development (OECD) was able to pass with little fanfare. It initially estimated the country’s GDP to be at 1.7% by the end of 2011 but later revised it to a more modest uptick of 1.5%. Painting an even gloomier horizon for the economy are the average Britons. The closely-watched consumer confidence report by Nationwide showed that people are really stressed out about securing jobs in the future. This was reflected in its consumer sentiment index for February which dropped by 10.0 points to its lowest reading since the survey began in 2004 at 38.0. Ouch! But don’t fret my chaps! Chancellor of the Exchequer George Osborne still has a lot of swag for the economy even when it seems like everyone else doesn’t! For those of you not in the know, “Chancellor of the Exchequer” is the fancy title given to the person who calls the shots in the U.K.’s fiscal and economic matters. Sir Osborne started setting the government’s expenditure limits last year and this coming Wednesday, he is going to announce his budget constraints for 2011. So what should we expect? Three weeks ago, the Chancellor gave a sneak preview of his game plan to get the country hustlin’ out of stagnation. One of his ideas is to stimulate growth in areas across the U.K. that have so much potential for growth but haven’t really gotten much support from the government. He hopes that by lowering taxes and applying less stringent regulation, the new “Enterprise Zones” will spearhead the country’s growth. On top of that, he also said he’s going to reconsider the planned tax increase on petrol to ease the financial burden on consumers in the midst of soaring oil prices. Now before you get ahead of yourselves, I want to clarify that just because he sympathizes with the people, it doesn’t mean that the Chancellor is a complete softy. Ha! You wish! He reiterated that the government will go ahead in implementing the budget cuts that it announced last year to cut down U.K.’s debt by 0.5% every year until 2015. Err, I’m not exactly sure if Britons will like hearing more about the government’s austerity measures as it is estimated to result in a loss of more than 300,000 jobs in the public sector. However, given that the U.K.’s public sector net borrowing is already high at 10% of its GDP, maybe the people will just have to deal with Osborne’s tough lovin’. What other choice do they have? Sure, the government can ask for aid, postpone tax hikes and budget cuts, but ditching its plan to fight off its debt will only undermine its credibility to financial markets and send the wrong message to its bond investors. This would only make it more expensive for Britain to get its financial house in order as bondholders would demand higher interest rates to compensate for the possibility of them not getting their money back. And guess who’s gonna pay for that? Yep, that’s right! The average Britons. The truth is that the U.K. will have to pay for its debt sooner or later, in one way or another. So why prolong the suffering, right? As for pound, I think it’s way too early to tell how the government’s budget plans will affect its fate on the charts. 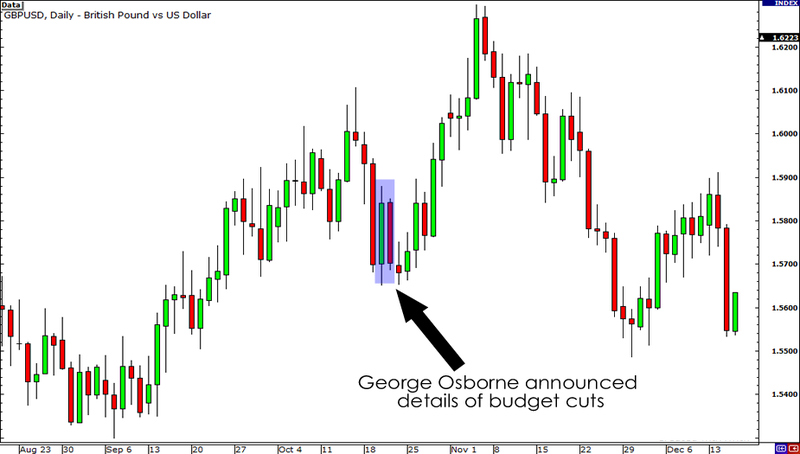 One scenario could be that the currency would rally just like it did in October 2010, after Osborne detailed the austerity measures. But then again, it could also take a plunge if traders feel like the balance between fiscal consolidation and economic growth isn’t sustainable. There’s only one way to know for sure though, and that’s to keep an ear out for it on Wednesday at 12:30 pm GMT!